B0836. 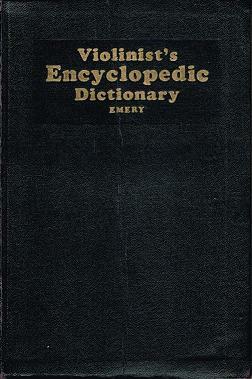 FREDERIC BARCLAY EMERY. 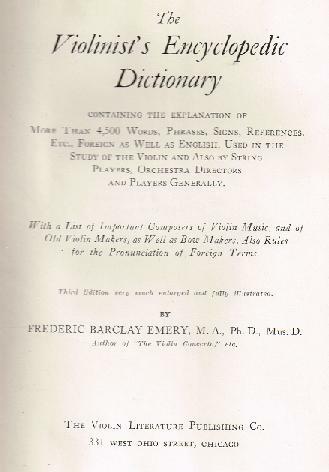 THE VIOLINIST'S ENCYCLOPEDIC DICTIONARY, containing the explanation of more than 4,500 words, phrases, signs, references, etc., foreign as well as English, used in the study of the violin and also by string players, orchestra directors and players generally. With a list of important composers of violin music, and of old violin makers, as well as bow makers, also rules for pronunciation of foreign terms. 330pp. Chicago, The Violin Literature Publishing Co., 1928. Appendices. Hardcover. Excellent copy is ever-so-slightly wrinkled.